Hi! I am Roy and I am 8yrs old. I enjoy attending Classic Car Shows. I wanted my own car so I could partcipate in the shows. I choose the body style of the car I wanted and my mom and dad bought it for my 6th Birthday. 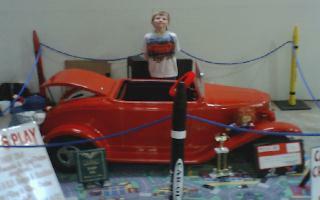 My dad and granddad built the car. It took a few months to get it together and now I drive it and enter it at car shows. The basic kit was built and then my dad added headlights, parking lights, dual exhaust and a horn. The car runs using a 5 h.p. Briggs and Straton motor. I can go 45 m.p.h in my car. Also, the dash has switches to operate the lights and an AM/FM Stereo (but now I want a CD Player). Originally, the car was plain red with no windshield or top. My dad used transmission lines to create a convertable top frame and metal and plexi-glass to create the windshield and frame. A friend of ours made the interior and opplostered the convertable top frame. The car was then taken to Liquid Air (Fredericksburg, VA) to have the paint and graphics work. The car was painted a bright red with pearl effects. Then they added Ghost flames and the skull and crossbones (says Bad to the Bone) to the trunk. The first time it came back from the paint shop, it wasn't the red I had in mind, so I had my parents send it back and now it is perfect! I designed my car myself from paint to accessaries. I love reading all types of car related magazines and I get my ideas from there. In the beginning of 2002, my car is going back to the paint shop. I have had it for 2 years and it's time for a new paint job. I want it to be black with flames (red, yellow, orange). I hope to have it ready for the car show season in April. I recently bought a 1967 Corvair convertable and at age 7 and I am working on restoring it. Once restored I plan to have my mom and dad drive it to shows forme. In a few years I hope to sell it and buy the classic car I really want (1958 Ford or a 1956 Ford Truck) when I am old enough to drive.